The latest fully continuous waste tyre pyrolysis plant is designed to ensure safety, environment firendly and profits. This plant not only can work continuously for 24 hours but also can feed in one side and discharge in another side. 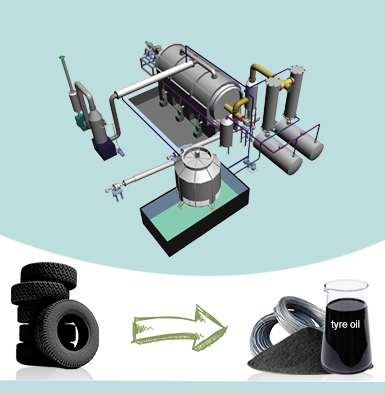 The continuous tyre pyrolysis plant can deal with waste tyre, rubber, plastic, medical waste and oil sludge. 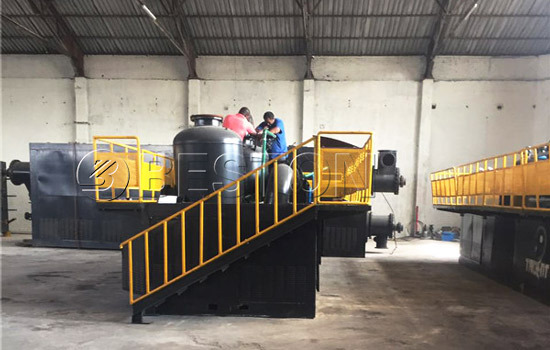 Up to now, Beston tyre pyrolysis machine has been exported to many foreign countries, including Romania, South Africa, Indonesia, Nigeria, Brazil, Korea, Dominica, etc. 1. Screw feeding sealing system. 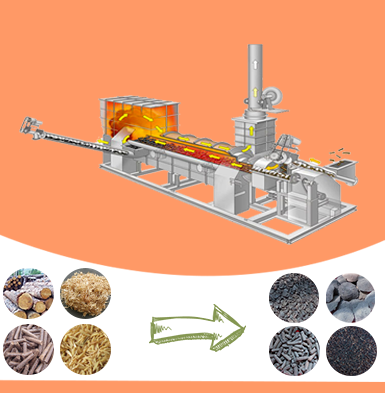 Continuous pyrolysis equipment adopts screw feeding sealing system technology, which is hold by the company’s invention patents. This technology will prevent the heat from spreading. In addition, this screw method guarantees uniform feeding. 2. Manageable electrical control system. This control system is combined with emergency stop device, thermometer, pressure gauge, etc. We can monitor working condition of the whole plant to make sure the plant is running normally. It indeed saves labor costs for investors. 3. Unique dedusting system can basically realize zero emission pollution. In some countries, the environmental standard is extremely strict. 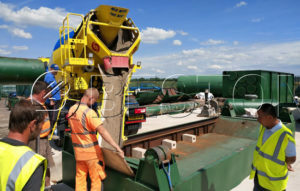 Beston dedusting system will adopt three steps to guarantee that the discharged waste smoke comply with European emission requirement. The three procedures including water rinsing, ceramic ring adsorption and water spraying. 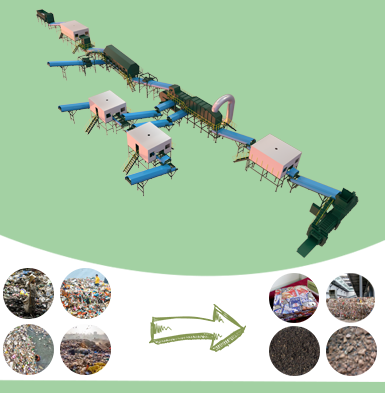 In addition, adding activated carbon is also available in Beston tyre recycling plant. In order to make safety and energy saving for customers, the continuous pyrolysis plant is equipped with moving horizontal pyrolysis reactor, circulation heating system, strong dedusting system, etc. 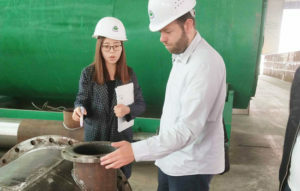 From tyre to fuel recycling plant, we mainly get four products, such as oil, steel wire, carbon black and combustible gas. 1. 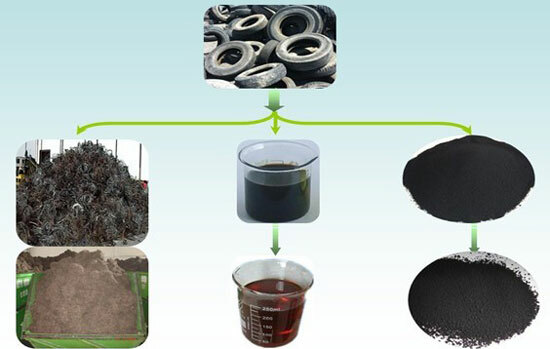 The tire pyrolysis oil can be used as industrial fuel materials for burning, or further refined to diesel or gasoline by waste oil distillation equipment. 2. 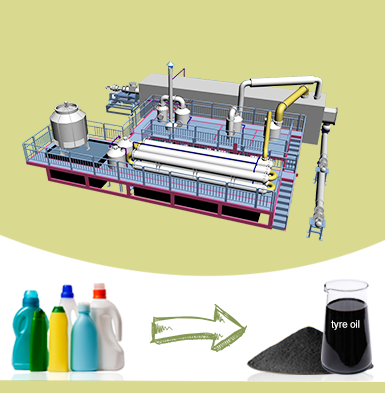 The carbon black from tyre pyrolysis can be used for construction bricks with clay or used as fuel. 3. The steel wire can be re-sale or reprocessing. 4. There is also a little combustible gas producing in the process, the gas can be recycled to heat the reactor as fuel, which will save energy for the whole working process. 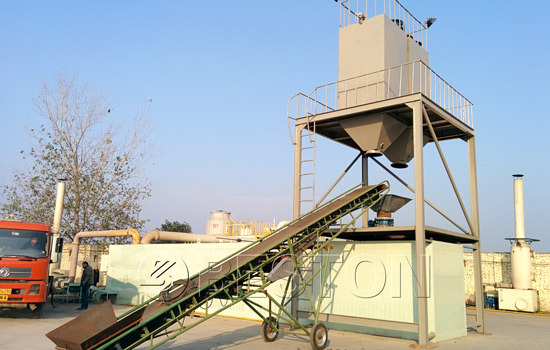 Pretreatment: before pyrolysis, the whole tires need to be shredded into small pieces. First, pull out the steel wire in tire sidewall. Then cut the tires into bulks. If the tires diameter is less than 1200mm, we don’t need this step. We can directly use next comprehensive shredder to cut into small pieces. Crush the tire bulks or diameter less than 1200mm into 2-5cm small pieces. 1. Put scrap tyres into reactor by the sealed screw conveyor in the waste tyre to oil plant. 2. When temperature reaches to 100 degree, oil gas will be generated. Then oil gas enters into manifold. Heavy particles will be liquefied into heavy oil and drop in the oil tank. The light oil gas rise up and goes into condenser uniformly. The light oil gas will be liquefied into fuel oil. A large scale of oil gas will be liquefied into fuel oil and enter oil tank. 3. In the hydroseal, the combustible gas will be desulfurated and cleansed, then recycled to the burning room to provide heat, saving a lot of fuel. 4. Hot smoke gets out from the reactor through the inner pipe of heat exchange system, heat exchange system. In the flue condenser, the smoke will be cooled down, then enter the dedusting system. In the spraying tower, the smoke will go through the water washing, water spray and ceramic ring adsorption. After four filters, the clean smoke can meet the EU environmental protection and emission standards. 5. The carbon black with steel wire will be discharged by the auto screw discharger. Through the magnetic separator, the steel wire and carbon black will be separated and transported into the storage tank. Finally, the tyre treatment process is over. 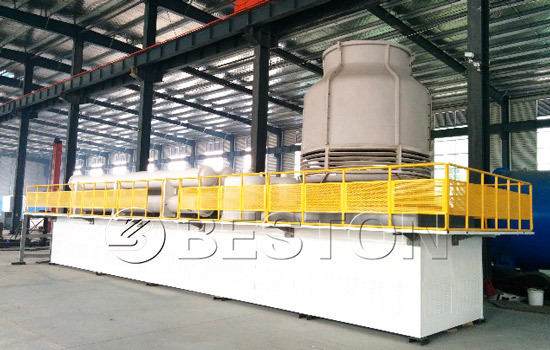 As a professional manufacturer in China, Beston continuous waste tyre pyrolysis plant mainly has one models: BLL-30. And its daily capacity is 30 tons. Because of its special design of reactor, the pyrolysis process of tire is full. Accordingly, we can get more oil or oil gas from this system. 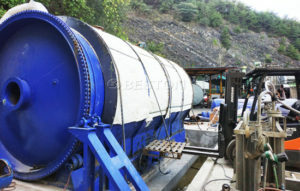 The continuous tyre to oil machine is easy to manage, which brings convenient to investors. 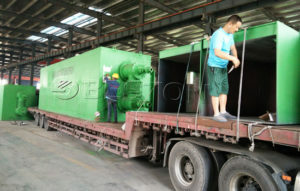 Besides, every set of machine will be equipped with reducer which can prolong the service life of machine. What are you waiting for? 1. Customized service. 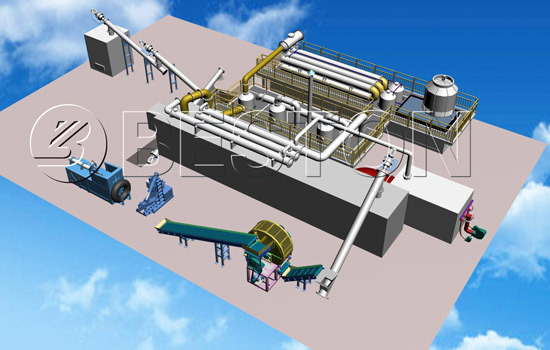 Customize special continuous waste tyre pyrolysis plant for you if you need. 2. Installation service. For each set of machine, one technician will be sent to guide your installation, test the machine and train your workers. 3. Periodical call visit to make sure there is no problems of tire recycling equipment. 4. Turnkey project according to different situation of your country.